Bedford Technology was created over 20 years ago by a group of innovative engineers. With innovation and engineering at the core, these are deep-rooted company values are encouraged and supported throughout the entire organization. As the leading manufacturer of structural recycled plastic lumber, Bedford Technology offers innovative solutions for your building and construction needs. Bedford Technology originated as a division of Bedford Industries. Bedford Industries started in 1966 as a plastic coated wire twist ties manufacturer for the bakery, produce, coffee and medical industries. Bedford Technology was the machinery division of Bedford Industries that focused on the machinery involved in the twist tie manufacturing processes. The collaboration between the two divisions proved to be a successful venture for Bedford Industries because of the engineering expertise of Bedford Technology. Throughout the manufacturing process of the twist tie products, plastic scrap material, or trim, is produced. Oftentimes, this material was thrown away. This posed a question and presented a bit of a challenge: What should be done with all of this plastic scrap? In the early 1990’s, a solution was found: instead of sending the plastic trim to the landfills, the resourceful engineers at Bedford Industries manufactured an environmentally-friendly solution: a structural, long-lasting and durable building material known as plastic lumber. With a new product offering, Bedford Technology now specialized in machinery AND plastic lumber. 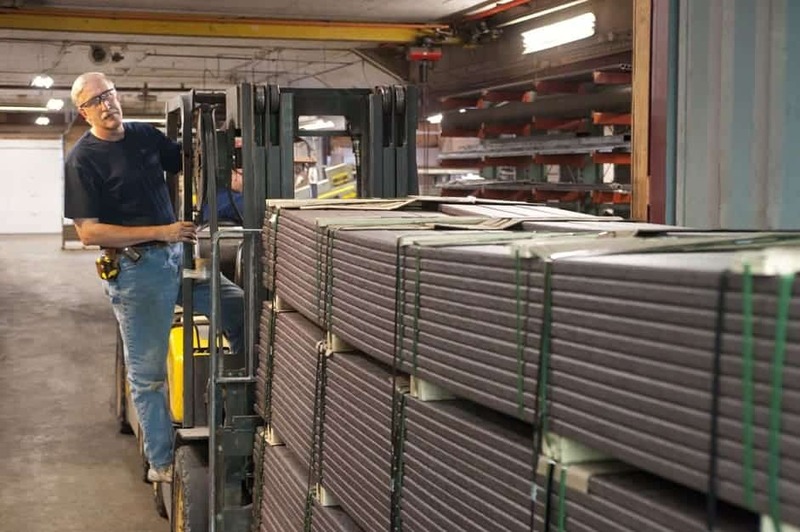 As Bedford Technology started to navigate through the plastic lumber industry, innovative opportunities kept presenting itself, and the engineers really grew the division over the next few years. The plastic lumber business skyrocketed, and the machinery division was sold to allow for more time and dedication to this growing plastic lumber industry. So, Bedford Technology became a separate company, whose sole focus was plastic lumber. Brian Larsen, founder of Bedford Technology, was the catalyst that helped shape Bedford Technology into what it is today. As an engineer himself, Brian understood the capabilities and innovation that derived from an engineering background. This understanding and mindset paved the way for Bedford Technology, and allowed more opportunities to enhance performance characteristics and new products. Finding ways to improve is top-of-mind at Bedford Technology. Not only does this include the products and processes, but also the operations within the company. In 2010, Bedford Technology partnered with an investment firm, Hillcrest Capital Partners. With the rapid growth in the plastic lumber business, Bedford Technology needed more room, more equipment, and wanted to improve even more for their customers. Hillcrest Capital Partners is a family-oriented organization that had the business expertise that Bedford Technology was looking for. What brought these companies together was the alignment of company values and the priority on the people behind the product and the business as a whole. With their advice and business development skills and our engineering roots, it was a match made in heaven. This partnership improved business operations, provided new opportunities and allowed our product innovation and development to grow. Due to this tremendous growth and success in the industry, in 2011, Bedford Technology closed the acquisition of assets including production equipment, tooling, trademarks and patents associated with SeaPile® and SeaTimber® product lines, which are advanced composite plastic piles and timbers for marine applications. This allowed Bedford Technology to grow the marine industry division of the plastic lumber business and offer environmentally-friendly building materials for wet environments. As early pioneers in the plastic lumber industry, innovation drove product development for Bedford Technology. Using the Hard Tool manufacturing process (similar to injection molding), Bedford Technology produced the first product line: SelectForce® by Bedford Technology. While this product proved to be a sturdy, durable and sustainable alternative to other building materials, the engineering team wanted to find ways to improve the product features and performance characteristics to even better serve the construction market, and many small steps were taken to achieve this goal including product testing and using additives to enhance the product characteristics. Bedford Technology now offers five product lines, each providing unique attributes for a wide array of applications and uses and three manufacturing processes that have been perfected by the engineers are Bedford Technology to provide industrial-grade structural recycled plastic lumber and specialize in commercial markets including marine, parks and recreation, landscaping, agriculture, large animal and equine and more. However, Bedford Technology is more than manufacturing. Company values are a huge part of the business and inspire our team so that Bedford Technology can offer the best solutions for construction project challenges (even though the best solution may not exist… yet). Bedford Technology drives innovation, environmentally-friendly initiatives and customer-first thinking through all product lines, processes and operations. Below are our company values that act as inspiration and are practiced at Bedford Technology. Innovation – Innovation is showcased throughout the company. For example, Bedford Technology has an in-house engineering team that uses their expertise and experience to help find the best solutions for our customers and provide support for unique or unconventional applications. Green Building & Protecting the Environment – This holistic concept promotes positive effects on the environment throughout the entire life-cycle of any building project. From manufacturing process to finished material, Bedford Technology cares deeply for the environment. Engineering sustainable building materials is one way to show our appreciation. Bedford Technology has kept millions of pounds of plastic out of the landfills, and will continue to help protect the environment by continuing to engineer recycled products that can also be recycled, and continue to enhance product performance characteristics to conserve natural resources like wood. Customer-Centric – Working with Bedford Technology is a true partnership. Our focus is the customer. Understanding the specific needs of the customer and prioritizing those needs allows the partnership to flourish and develop. From product testing to high-quality standards, Bedford Technology is here to answer all questions and to find the right solution for your project challenges. Port of Hueneme Harbor Deepening Project Begins: Construction Materials Arrive Today!